A great way to learn and teach THE WRITING PROCESS!!! Do your students have trouble developing an outline and a rough draft? Are their thesis statements off-topic or their paragraphs lacking structure? Are you looking for a thorough way to incorporate both standards based and 6 TRAITS WRITING in your classroom routine? 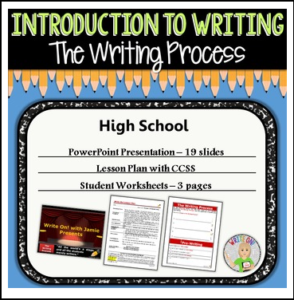 Here is EVERYTHING you need to start helping your students understand THE WRITING PROCESS today! This lesson focuses on how to ORGANIZE and develop IDEAS for writing an essay. The students will be introduced to the different STAGES in THE WRITING PROCESS. Additionally, the lesson focuses on how to differentiate between the STAGES IN WRITING and how to use each one. During the lesson, students can not only interact with the SMARTBoard/White Board, but also can practice guided note-taking on their worksheets. BUY THE FULL INTRODUCTION TO WRITING Unit (8 Complete Lessons listed above) FOR ONLY $22!!!! Link- High School – Introduction to Writing Bundle– 8 LESSONS!!!!! This bundle download has all 8 lessons, will save you over 20%, and will give you everything you need to help your students increase their ORGANIZATION and incorporate complex IDEAS in Writing! If you enjoy this product, please FOLLOW MY STORE and don’t forget to LEAVE FEEDBACK!